Mr Dean has still not reached Jamaica yet. Still a category 4 Hurricane. 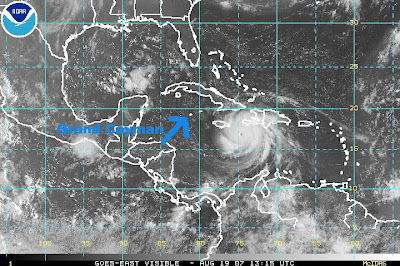 The Cayman Islands has officially announced a Hurricane Warning. Which means that a Hurricane is expected in the next 24 hours. “Duh”. No chance of escaping now. Last plane will leave at noon today and then they close the airport. The flights have been running through the night. Our friend Hannah was on the 1am flight. She had planned to leave and had bought a ticket before this all started. Cayman Airlines has told people to stop phoning or turning up at the airport as there are no more tickets! Yesterday evening we plastic bagged all our clothes. Put them on the top shelf just in case we get flooded. Our hurricane supplies are close at hand and our passports are in my waterproof box. Our apartment is build to withstand category 4 winds and the landlord has put up ply boards on our back windows. We might spend the night upstairs with our neighbours. If the roof comes off we’ll move down again. It’s a little windy right now. I’m not sure if we are feeling the starting winds or it is the the local weather. There is definitely tension in the air. I better get back to the weather channel to see how much more time we have! Check out this latest satellite picture 8am this morning.